← Why the STEM Female Role Model Spotlights? My daughter loves to build. I mean really loves to build. It started with tower-building, where she would build these precariously stacked towers taller than she was – and I still have no idea how she ever managed to get them to stay up. Even built four feet high, tilted on the edge of a rug and slanting sideways all the way up, she could get the darned things to stand. At least until the dog came by and knocked them down, after which there would be a brief period of outraged wailing, followed shortly by a new tower. Gradually her repertoire expanded from towers to castles, castles to cities. Mega Bloks gave way to my old set of Duplos, and the colorful small set of Melissa & Doug wood blocks was supplemented by a set of Mad Scientist alphabet blocks and a bigger, plain wood set of Melissa & Doug blocks. We’re just about ready to move on to regular legos, so watch out world. Almost anything can be added to a block city – even old berry baskets and hippos! It warms my heart that she loves to build so much. She has this amazing single-minded intensity when she is building things. So with her fourth birthday coming up, I’m very excited to see what she makes of the latest additions she’s going to get to unwrap: Lincoln Logs and Tinkertoys. These were some of my childhood favorites that I was very pleased to discover have made a comeback. Playing with building toys is a great way to encourage valuable skills in kids that are applicable in so many areas. While my relatives and I joke that my daughter’s current building obsession must mean she will grow up to be an architect or construction worker someday, I’m really just happy that there’s an activity she likes so much that has many long-term benefits. 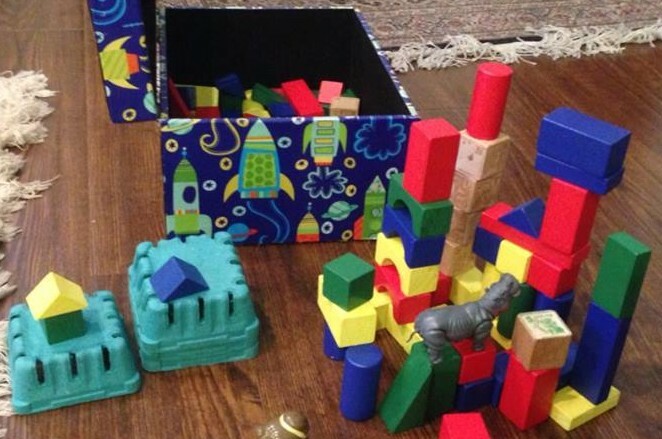 Building is great for spacial orientation, balance, hand-eye coordination, fine motor skills, and planning skills. And blocks can even be dual-hatted and used for teaching counting, ordering by size, shapes, pattern-making, and geometry. I remember building massive lego cities as a kid, and can’t wait to do that again with my daughter (yes, I may have some ulterior motives here… there could perhaps be eventual purchases of lego sets that are things I always wanted as a kid!). It never even occurred to me as a kid, playing with my sisters and brother and friends, that legos weren’t anything but a unisex toy. I’ll save the new “girl” legos for another post, maybe sometime when I have had a good day and a couple glasses of wine and can talk about it calmly and rationally instead of ranting. I also like that building toys are one of the better types of toys for playing across a span of ages. Older kids and younger kids, parents and children, crazy uncles and grandparents – everyone can play together with these toys. Well, when you can get the kids to share, at least. And they are definitely a more grownup-friendly form of play for me. I can only do so much pretending to eat plastic-food meals my kid has prepared, but I’m happy to build with her for a good long while. And a lot of adults still play with these toys – just look at Lego conventions and competitions. But professionals use them as work tools, too. I remember being stunned when, as an undergraduate working a summer internship at NASA’s Johnson Space Center, I discovered a drawerful of legos, k’nex, and Tinkertoys. I needed something to demonstrate how an attachment mechanism on the space station moves, in order for someone to make a computer animation of it. I had been attempting to make a moving model out of paper clips, erasers, and rolled up notebook paper. Instead, my supervisor took me over to a nondescript cabinet, pulled it open, and showed me the toys inside. He said it was common for engineers to use these things to demonstrate moving parts and play with new ideas. That was the first time I realized that engineering was so very much more than the academic side I was so immersed in. Engineering was about creatively making things work. It’s also a job where no one will bat an eyelash if you play with legos at work. I was sold – I had definitely picked the right major. So I encourage you to encourage your kids to play with these types of toys. They are sturdy, and can last through several generations of kids. My parents kept our wooden blocks and Duplos and now the grandkids use them. They are fun, simple, and good for group play across ages and generations. And you never know when getting down on the floor to build a block tower or create a lego battle scene will give just the right spark to a budding young architect, engineer, astronaut, artist, or construction foreman. What were your favorite building toys as a kid? Have any recommendations on the latest and greatest, or fond memories of great building-toy achievements?